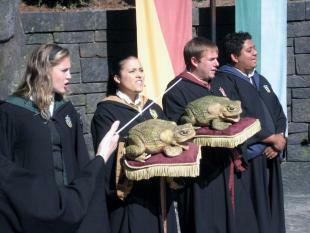 The Wizarding World of Harry Potter at Universal Orlando Resort brings the written words of J.K Rowling to full life. Since the opening of Hogsmeade in the Spring of 2010 and Diagon Alley in 2014, these magical lands have captured the imagination of guests by transporting them into the land with which so many have become familiar through both the books and films. The two lands of The Wizarding World of Harry Potter (Hogsmeade at Islands of Adventure and Diagon Alley at Universal Studios Florida) were designed as a collaborative venture between J.K. Rowling, Warner Bros. the design teams responsible for the movies, and the design team of Universal Studios. The key element for all involved was in keeping the experience authentic and true to the movie. This thought process extends not only to the facades and interiors, but is equally visible in everything from the menu offerings at the various food outlets and products available for purchase in the different stores to the costuming of and conversations with the many cast members who are integral to creating the magic. 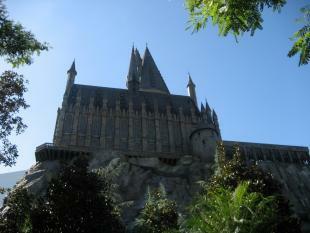 At Islands of Adventure, Hogsmeade is home to Hogwarts, which towers over the town. Enter the castle to find the School of Witchcraft and Wizarding in full swing from the Professor Sprout's herbology-Mandrake-growing-greenhouses to the portrait covered Grand Staircase where conversations ensue among the pictures while visitors listen in. Step to Dumbledore's Office as you explore the corridors and classrooms each with secrets and surprises before taking off on a wild ride to adventure with Harry and his friends. Insider tip - Potions classroom: Listen closely when in line for The Forbidden Journey, as you will hear a professor lecturing and maybe pick up a thing or two. In the town below, the butterbeer and pumpkin juice flows. The detail is extraordinary, so peeking into every window, reading all the signage, and looking around corners is highly recommended. Be on the lookout for the performances of the Frog Choir, which is not to be missed. Honeyduke's sweetshop lets guests take home Bertie Bott's Every-Flavour Beans and Chocolate Frogs and the window display featuring Puking Pastilles leaves no doubt what eating those treats will do. Insider tip - Shop windows: There is lots of magic going on, from the mysterious cello in the upper window of the Dominic Maestro's Music Shop playing itself to the measuring tape cat wagging its tail in Gladrags Wizardwear. Take a photo beside Hogwarts Express and ask the conductor all those unanswered questions about the train and Hogsmeade you have always wondered. Duck into Owlery. Be sure to look up before you take a seat as you may want to be careful. There are many occupants in the rafters. 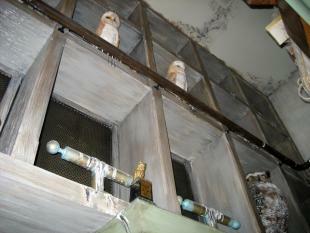 Insider tip - The Owlery: Keep your eyes peeled for the cuckoo clock-style owl that pops out periodically. If you get peckish while in Hogsmeade, step into the Three Broomsticks for delicious Fish and Chips or delectable Shepherd's Pie. Step over to the Hog's Head pub for some libation and be entertained by the snarling hog head above the bar. Even in Wizarding World, there are healthy options including Kids Meals that offer the choice of fresh fruit or trans-fat free fries. Insider tip - Hogsmeade's restrooms: Moaning Myrtle is haunting in there so definitely worth a trip to the loo. 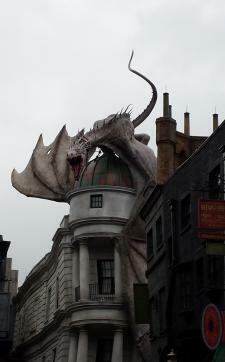 At Universal Studios, Diagon Alley features Harry Potter and the Escape from Gringotts, an amazing ride that goes beyond a roller coaster through the use of 3D technology, impressive sets, and brilliant effects. Standing in line is almost as fun as the ride! Be sure to look at the newspapers with moving pictures, check out the names of some of the books, and watch the goblins hard at work at the exchange. Insider tip - Gringotts Money Exchange: Meet bank goblins who will be only too happy to exchange your muggle money for Wizarding Bank Notes, legal tender in the Universal parks. The experience in the shops here is not to be missed! Borgin and Burkes: At Borgin and Burkes in Knockturn Alley, step in to find all kinds of scary objects for dark magic as you work your way through to the back where the Vanishing Cabinet resides. Listen closely and you may hear the chirping of a bird coming from inside. If you have a wand map, be sure to take a look at it under the blacklight outside to reveal mysterious figures in invisible ink. Madam Malkin's Robes: At Madam Malkin's Robes for all Occasions try on a robe and stand in front of the mirror, which will be happy to share her thoughts on how you look in your new attire. Fair warning, she isn't always pleasant. If you like reptiles, REALLY like reptiles, enter Magical Menagerie via the side entrance and peer into the window alongside the doorway. Insider tip - Shop illusions: Look overhead in Magical Menagerie to see the rats busy at work or focus downward at the bottom of the white dress in Madam Malkin's to see amazing changes manifest. Quality Quidditch Supplies: Next to Weasley's Wizard Wheezes, Quidditch players can be well-supplied, as can any house member at Quality Quidditch Supplies. 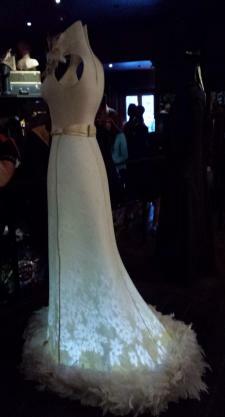 Check out the antique Quidditch uniform on display. If you need wizarding supplies, then head over to Wiseacre's Wizarding Equipment. Even if you don't need anything from there, it is worth going in just to look up at the ceiling for an astronomical view. Insider tip - Pygmy Puffs: While most Pygmy Puffs only sing on New Year's Eve, the ones in Weasley's Wizard Wheezes sing year 'round. You'll find plenty of tasty treats in Daigon Alley. While the Leaky Cauldron features the same fine fare as Three Broomsticks, Florean Fortescue's Ice-Cream Parlour is well worth the wait. Highly recommended is the Chili Chocolate and Earl Grey Lavender ice cream, each magical in its own right. 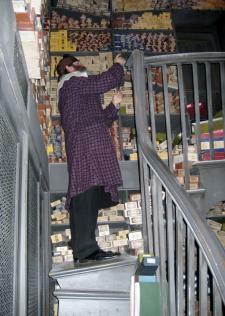 No trip to The Wizarding World of Harry Potter would be complete without a visit to Ollivanders Wand Shop, and there are locations in both lands! There are character wands for the likes of Bellatrix, Hermoine, Ron, Luna, yes, even Valdemort, among others, available. You can also find wands made from unique woods, like birch, rowan, hazel, and holly, to align with the individual personality and character traits of the witch or wizard. Each of the wands, character or wood, are available in two styles - traditional and interactive. The interactive wands allow the bearer to use the magic of their wand to conduct special magic at identified locations within the two lands. A map is provided that indicates both where the medallion for the magic can be found and the specific movement that must be conducted with the wand to make the magic happen. Point the wand at the toilet in the window of Weasley's Wizard Wheezes or illuminate the window of Flimflam's Lanterns. Hogwarts Express makes the experience between the two parks wholly unique. Departing from Platform 9 3/4™ at King's Cross Station in London on the Universal Studios Florida side and arriving at Hogsmeade Station at the Islands of Adventure (or vice versa), guests with two-park admission or annual passes can travel between the lands and have an adventure on the way. Insider tip - King's Cross Station: In front of King's Cross Station, you can see the Knight Bus, watch the shrunken heads entertain, and chat with the conductor. Go around to the back and peek inside while you're there. Be sure to go into the English phone booth, too, and dial 62442 (MAGIC) for a special message from the Ministry of Magic. This unique travel brings guests a seamless excursion from the daily life of muggles to that of wizards and is a not-to-be missed part of the adventure. The story is different in each direction, too, so be sure to plan to travel both ways. Insider tip- Platform 9 3/4: Have one member of your party stand where they can view the portal to the Hogwarts Express platform as the rest of your group moves ahead to get picture of them disappearing into the infamous brick column or, even better, record a video of it. For both the Harry Potter super-fan and the novice wizard or witch, plan a visit to these two amazing lands to be immersed into different times and places. There is so much to explore, discover, and do, and the shopkeepers and characters that frequent both sides are eager to further personalize your experience. A trip to the Wizarding World of Harry Potter is like stepping right into the books and becoming a part of the amazing story and finding your own secrets into that magical place. Oh, and don't forget to look for the fire-breathing dragon!